Crach An Craite is a Character/NPC in The Witcher 3: Wild Hunt. Crach An Craite is the clan leader of the Craite Clan on Ard Skellige. 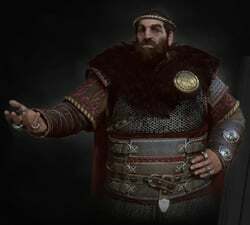 "Skellige sagas brim with praise for war chiefs and warrior-braves of ages past, yet the saga of Crach, jarl of Clan an Craite and lord of Kaer Trolde, will outshine them all. it will sing of his strength, his courage, his wisdom, his generosity. his loyalty to friends and his relentless pursuit of his foes. There will be few exaggerations in such a tale, for Crach. the mightiest of Skellige's jarls. truly did possess all the traits of a hero. He aroused terror in his enemies - in fact. Nilfgaardian mothers would use his name to frighten their children into obedience, and all in that empire spoke in hushed tones of the infamous Tirlh ys Muire, the Wild Boar of the Sea. who devastated coastal provinces during frequent and terrible raids. Geralt had known Crach for long, since a time when as a young man the jarl had sought the hand of young Pavetta. Ciri's mother."